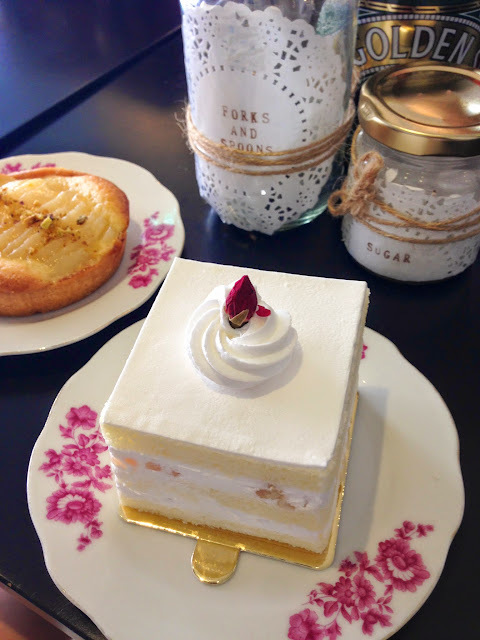 I procrastinated a little in posting about Bloomsbury Bakers because I wanted to return one more time before i did a review. Unfortunately it seems like I won’t have time (it’s a little out of the way) so I might as well just post what I have now. 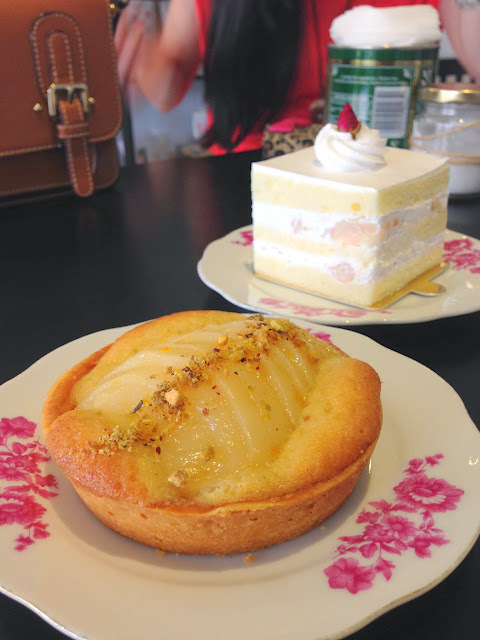 We shared the lychee martini cake and their pear frangipane. Both were delicious. I don’t fancy frangipane but here the baked pears dominated the tart and the remaining bits of frangipane were very moist,-some bits a little mushy- perfumed by real vanilla beans, and the almond meal was super fine, not grainy. I think they use the same recipe and technique as carpenter & cook for their tart shell. This doesn’t come as a surprise since the baker also graduated from Cordon Bleu London like Shenn at C&C. The crust was buttery, short, and rolled out thin. This is one tart you must get! Their lychee martini cake is strictly only for adults- pine garden’s is I think, more kid friendly. The lychees were heavily soaked in martini, and generously layered between soft sponge and a light buttercream. I thought the frosting and slicing were done beautifully. The cake wasn’t very sweet so if you like things less sweet, this is for you. The tart looks quite good, the lychee martini sounds interesting, & I love the quirky dishes.